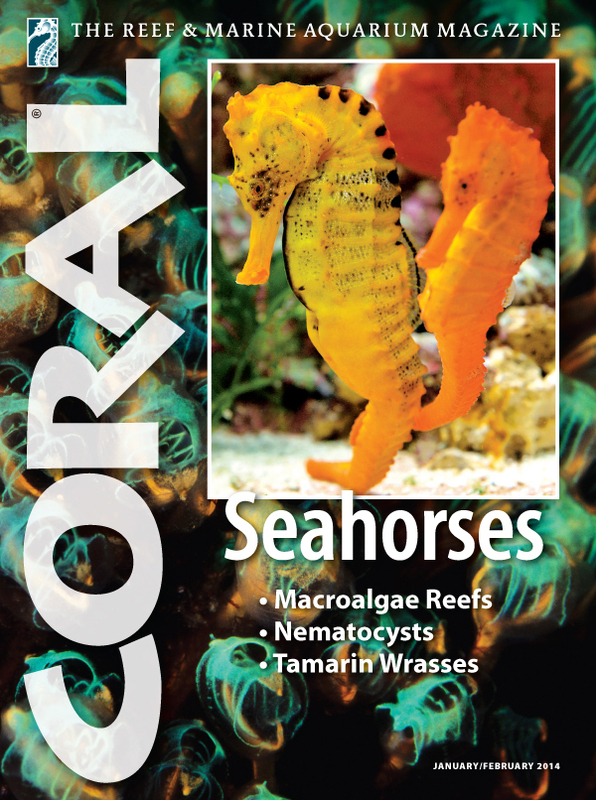 Launching into 2014 and its 11th year of publishing, CORAL Magazine will take a fresh look a Seahorses with cutting edge secrets to their successful aquarium husbandry, feeding, and breeding, a species guide to the best (and worst species for captive systems), and an updated report on their status in the wild. CORAL January/February 2014 Cover. Click to enlarge. The availability of big, vibrantly colored and fascinating seahorses from captive-bred stocks has never been better, and improved foods and husbandry guides bring successful seahorse keeping within the reach of many more marine hobbyists. 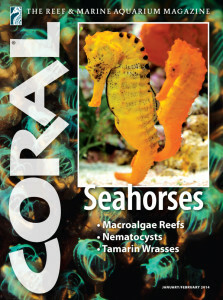 Seahorses also graced the first issue of CORAL, Volume 1, Number 1, long out of print and the most highly sought-after back issue of the magazine. This issue is a response to thousands of requests to revisit the subject of seahorses with updated advice and all-new images. • Gnarly Nematocysts: Invertebrate zoologist Dr. Ron Shimek reveals the astonishing powers and speeds of the microscopic stinging cells found in corals, sea anemones, and other members of the Phylum Cnidaria. Essential reading for every reef aquarist. • The Macroalgae Reef: An eye-opening look at unconventional reef aquariums aquascaped with beautiful macroalgae species, including a guide on how to balance a mix of corals and a choice of the best red and green marine plants. • Tamarin Wrasses: Once considered highly challenging to keep, the interesting and very appealing wrasses of the genus Anampses are becoming easier to maintain as experienced aquarists learn the tricks of acclimating and feeding them. Scott Michael offers an expert introduction this reef-safe group of labrids. • Donald Duck Shrimp: Profile of the highly unusual Long Snout, Plume or Donald Duck Shrimp, Leander plumosus, sure be added to many reefkeepers’ must-have lists of colorful invertebrates. • Playing With Fire: The First Captive-Breeding of the Flame Pipefish. Jim Welsh reports on his success with the beautiful Hawaiian endemic Dunkerocampus baldwinii, revealing many useful lessons for would-be breeders of other marine rarities. Deadline for materials to be included in this issue: December 10th. The issue has an on-sale date of January 7, 2014. The print edition of CORAL in English is distributed in the United States, Canada, the United Kingdom, Australia and New Zealand, South Africa, France, India, the Netherlands, Malta, and elsewhere. The Digital Edition is read in more than 100 countries worldwide. To find a local or regional dealer who offers CORAL Magazine, visit our current Source Directory.